It’s no secret that I like themes & holidays. I think special days should be recognized and celebrated, whether it’s a national holiday, half birthday, or month of awareness. Even the shortest month shouldn’t be overlooked. Even though I’m a huge fan of Valentine’s Day, during the month of February I found it more appropriate to focus on American Heart Awareness Month for the students’ sake. A month dedicated to heart healthy choices. In the classroom we worked our hearts to get them pumping while also tracking our pulse—not as easy with kindergarteners & 1st graders. Kids know activity is important for strong muscles, heart included, but not everyone understands the importance of having a healthy diet and how it affects heart health. Students understand that carrots are good for our eyes because of vitamin A, and dairy products have calcium, which gives us strong bones, but food affects our hearts more indirectly. That’s why teaching them about nutrition now is so important. Over time it will make a difference. It’s partially a larger concept for young students, but still extremely important when looking at long term health and wellness. Our heart healthy taste test was… dark chocolate. I love dark chocolate and thought students would appreciate trying something a little indulgent. Plus, it was fun to try chocolate of different cacao percentages… and then watch the kids’ faces as they tasted the DARK stuff. 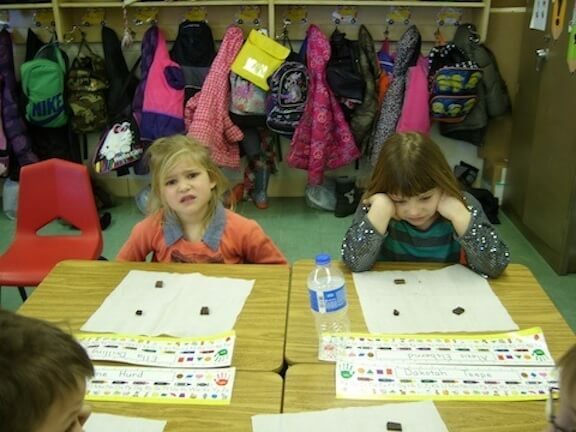 The look of disgust from 1st graders after tasting our chocolate. 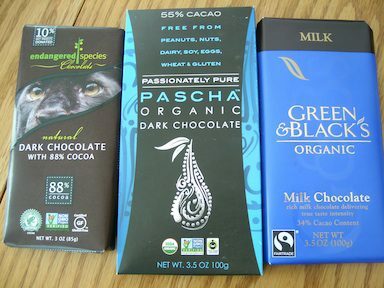 The darkest chocolate is healthiest for our bodies. Cocoa beans are rich in flavonoids, flavanols, and antioxidants— these things help protect our cells from toxins and also help repair damaged cells. Not only is dark chocolate good for cell health, but it has influences on vascular health, such as lowering blood pressure, improving blood flow to the brain and heart, and making blood platelets less sticky and able to clot. My lessons seem to be turning into “Paige’s Favorite Things,” but if I can teach students about health and nutrition while also incorporating my favorite foods, I know I’ll be more genuine and enthusiastic about the lesson. They were all good sports in humoring me, but then again they don’t have a choice. Grab a piece of dark chocolate and eat up, if not for your soul, do it for your heart. This entry was posted in Healthy Living, South Winneshiek CSD, Turkey Valley CSD by Paige Wettach. Bookmark the permalink.